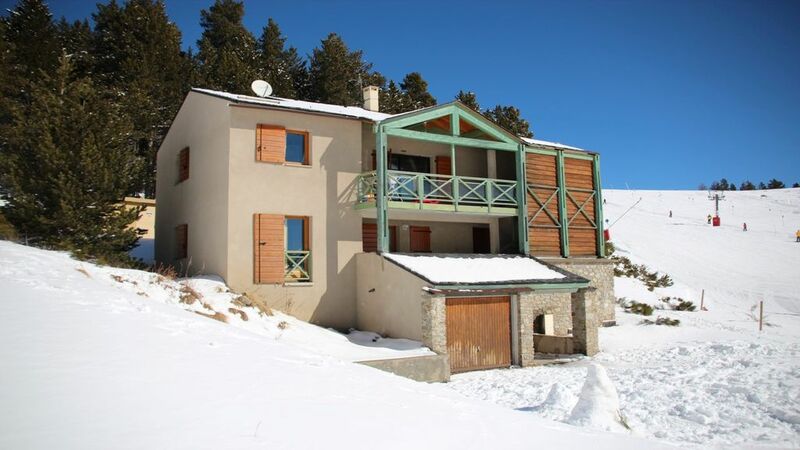 Apartments for 10 persons to rent in a chalet ideally and exceptionally located on the slopes in Angles in the sector Pla del Mir at 1800 meters above sea level, the chalet is 20 meters from the departure of the chairlift Pla del Mir and the beginner sector. 200 m from the chalet: baby track and carpet. It is also the starting point for all hikes in summer and winter. The situation is unique in the resort and the place is quiet. The village and the lake Matemale (tree climbing adventure park, pedestrian and equestrian walk, mountain biking, supervised swimming, sailing school, mini-golf, games for children) are less than 5 minutes by car; the entrance of the Angles Animal Park is 100 meters away. The gondola will take you to 2,100 m to contemplate the peak of Canigou and all our mountain with your mountain bike, your paragliding or just to go hiking to the peaks of Mont Llaret, Roc d'Aude or Pérics ... .. Apartment "ROUSSILLON" for 10 persons with 3 bedrooms + 1 mezzanine: 2 bedrooms with bed 140 and 1 bedroom with 4 bunk beds (90 x 190) and a mezzanine with 2 beds (90 x 190) bunk; 2 bathrooms, 2 toilets, fully equipped open kitchen, dishwasher and washing machine, ski storage with boot dryer, TV / DVD, free internet access and WIFI.